Hey, wow, it's March already! What are you weaving? 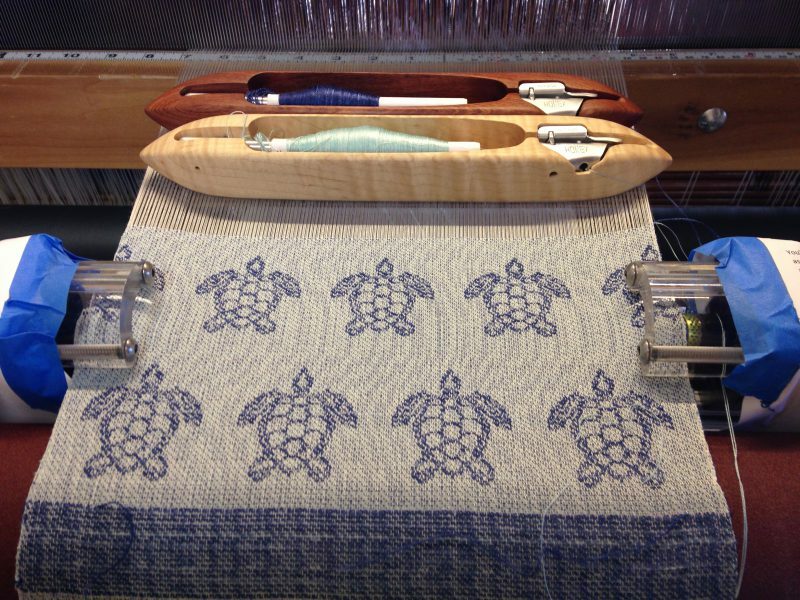 Out here, I'm weaving sea turtles! Since AVL is coming out tomorrow to fix my loom, I decided I should put a warp on it, if only for troubleshooting purposes. 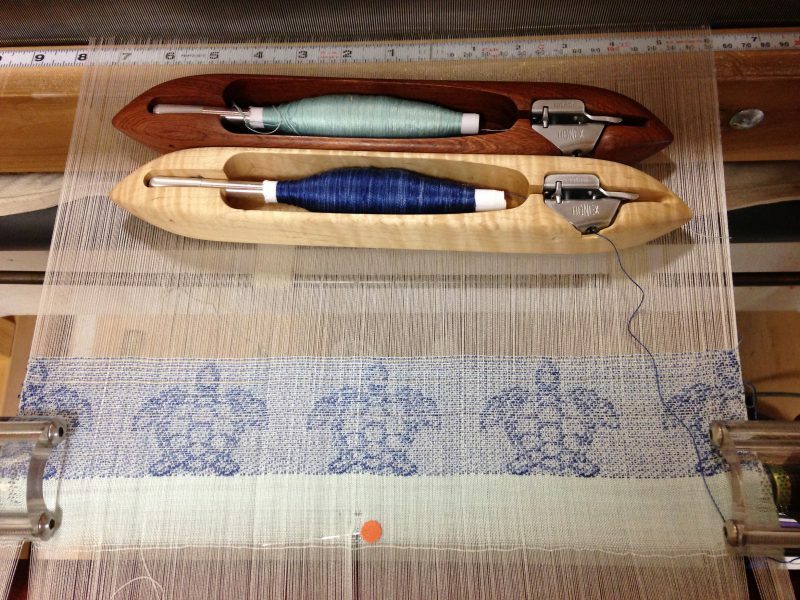 So I finished putting on the sea-turtle warp, and wove one set of sea turtles. It looks pretty good, even with flaws in the design from shafts 39 and 40, which are floating. Can't wait to get the loom fixed so I can weave off my sample exchange yardage! The turtles look wonderful. I'm doing ongoing weekly complete images this year, along with day by day bits (squares, rectangles, bands adjacent to the week's image). I completed February yesterday... will begin March later today. Image theme for this month? Soon to be decided! Tien, your Sea Turtle design is perfect, I love their shells! Good luck with the Big Fix! Still not weaving, but started knitting. I saw both your pieces in your blog posts earlier today. You are both very inspiring. I also attended the Cambridge Weavers, Spinners, and Dyers Guild meeting. Julie gave a very energetic and inspiring talk titled Meandering Threads. She does not keep a notebook, ratger she walks in nature and takes a lot of photos, which she uses as inspiration. I have always loved the idea of a sketchbook, but it has thus far always fallen by tge wayside. So this idea is intriguing. I keep an almost daily sketch book. Sometimes I spend longer with it than others. Sometimes it's just charcoal pencil, other times it's colored pencils ( I know some people who incorporate collage in theirs) usually I draw just ordinary things around the house, car keys, teapot, whatever's around, sometimes I just doodle. Many times these drawings have become the basis for tapestries. It's really fun to do! I am always so impressed with how creative everyone is. Today has been a kind of piddling around kind of day - baked earlier, then attacked the stash room. That was a mess, stuff all over the floor. I also had received many, many cones and spools are yarn when I bought my latest table loom and all of that was just heaped on my dining room table. That is now all put away upstairs in the stash room, along with the 3 new-to-me reeds for that table loom. Felt good to put some order in there. Wove a few inches on the bath mats and cut weft for another project that is on my 6-shaft loom. Ah, I undestand the feeling of accomplishment after a cleanup. I had to empty and move two big shelving units to get the AVL inside and set up. All the stuff (about 200 pounds of 10/2 and 5/2 cotton) is in boxes and on the floor in the main part of the barn loft. It's been too cold to work there, Tuesday, it's supposed to be 40'!!!!! That'll be warm enough to start picking it up and putting it away. It'll be nice to not see it lying around. for starting this thread - I wa not able to log into the site until a few minutes ago so missed starting the March check-in. BTW I am in love with the sea turtles. THeresa I agree with you there are so many talented people here on on Weavo and not just talented but generous in sharing their knowledge and experience with us! Laura hope you get back to weaving soon. Glad you are at least able to knit. Here in Central Texas iit is wet and cold but at least the threat of ice seems to have passed. and the lovely sound of warp seperators falling off the back of the loom That is one sound that I like to hear coming from my loom - just have 1/2 of the last bath mat to go and they will be off the Cranbrook. Beaming 11.5 yards of warp, and shoveling way too much snow. Almost done (with the beaming). More snow on the way tomorrow eve, so wish I could say the same about shoveling! I hope to begin threading tonight or tomorrow eve. The other difficulty with this warp is that the repeats were in odd numbers. So even tho' I was pulling from two packages of a single color, if the repeat was 3 or 9, (not an even number), I had to leave one thread at the bottom of the warp board, and continue back up to the top with the other, to finish out the sequence. Not cutting and tying off with every change not only saves time, but also materials. I told my guildmate my warping process can look a bit like an octopus at times. I have my next warp all sleighed, but not tied on yet. I was looking things over closly, but found 4 errors, which were easy to catch with there being two different warps. Tien, the sea turtles look great. I'm sure the loom will be back in shape soon. Cathie, like your drawings and tapestry rendering. Laura, you'll soon be back to form and healed up. I would love to see a tutorial on this method. It looks very interesting, challenging and useful. I broke down my studio 8 months ago as we were trying to sell our home - it is still on market. I had a couple of inspiring comments on my blog and spent Sunday re-building my studio and have three projects planned - it feels good to have my home base back! better than what I did. Years ago, I wove some color and weave on Rosepath threading, and was changing colors very frequently and with odd numbers too. I put pieces of velcro on my warping board, top and bottom, to hold the idle ends. It sort of worked but could not keep as nice of tension as what you have with the clamps. Thanks for the great idea! Bob, the owner of AVL Looms, came over today and fixed my loom. He fixed it in less than an hour, but then spent another three hours inspecting the loom, adjusting the alignment of the dobby box, setting up the auto-advance, and answering my (many) questions about this and that aspect of the loom. (I'm very pleased with the ripples running through the background. That is the result of using six shafts for the ties - the tie pattern is network drafted on a 3-end initial. The result is a very organic, curvy ripple, which I like a lot. It's subtle and appears/disappears depending on how you look at it. Glad the loom is fixed. What a relief. Tien, I can see the ripples - it looks to me as if the water were shimmering. Very very nice effect. And am happy for you that the loom is as good as (better than?) new. Super busy at work, missed a couple of my 10 minutes sessions, alas. And travel over most of the next two weeks (Florida and Washington DC). I will bring dishtowels to hem, and make an actual list of things I want to weave. You all inspire me so much, thanks. Love,love, the sea turtles. Lovely background, it's perfect! So glad Bob fixed the loom and gave it a good once over! Yes, your way is my way too, but I never thought to clamp the warping board to the loom ! What a great idea! I love all your clippies and stuff ! Don't you LOVE hardware stores? Hooray for the sea turtles. Dawn, I'm sure your back in your happy place now that your weaving. Your house will sell soon I'm sure. sea turtles are looking great. The ripple effect is awesome. So gald you got the bugs worked out of the loom! I also love the ripples on the background. The turtles still look great! Everyone is super active already. Well just for information and education, what was the reason those shafts were not lifting??? knife and would raise on the next pick. Go for it Tien! The troubleshooting chart I have ,admittedly very old, is so short! I would love a thorough presentation as I know you would give. Perhaps after you finish your book, it would be a tremendous contribution to many of us! I know your book will be a great contribution too! I LUV turtles. They are a good luck omen for my mother and the family has spent years adding to her turtle collection. I had hope to get back in the studio today as it was supposed to warm up. The good news is the snow has all melted away from the rain and the bad news is creeks are rising and flooding has commenced. Many local schools have sent kids home early while they can still get buses around. A brief stop at the studio assured me that at least one more day at home was in order, it was a balmy 40 in the studio and with the moisture in the air it would take HOURS to heat up to a tolerable level. I know spring is coming. Today I will finish off a tartan scarf, beam another overshot potholder warp, and wind cones for chenille scarf. Thinking of doing a basic basket weave for a quick & easy project. I picked up a new retail outlet yesterday (YEAH!) and they have specifically asked for Fiesta inspired kitchen towels. WV is home of Homer Laughlin and we love our Fiesta ware. Any thoughts or ideas? I'm always amazed at what you all create with tapestry. I admire your patience. I have never been inspired to try my hand, but perhaps someday I will take a class just to say I have. What is the largest tapestry loom you have worked on? My ongoing archiving of a personal collection has me wondering what to do with a 5'x6' tapestry. It's mostly handdyed wool. Themassive tapestry loom was built into the center of a bedroom. Some of you know Bruce from Purrington, he tells of coming home from college and finding that while he still had a bed to sleep in the rest of the room had become a tapestry studio. Shelving was built behind the loom and while no weaving has been done for MANY years it is still sitting there like a beacon. Several years ago I was invited over to a rather prolific tapestry weavers house. She had several very large tapestries 6 ' long for sure maybe 4 ' wide that she had done. She had a pair hanging back to back suspended from the ceiling and used them as a room divider. I would hang just one so you can look at the back, which is very interesting to see. Erica, I love the thumbs up/like button you introduced about a month ago, and the new bookmark and report spam buttons on messages, too. I see we can also quickly report a spam post (initial post). Thank you! Someone on Facebook was actually weaving Fiesta themed napkins recently. :) Not sure if the link will come up unless your joined in the group. There was a gamp kit from Lunatic Fringe. Fiesta towels/warp/colours definintely go along with the beautiful day we've had today. The best part of my day, other than my amazing family, has been finishing hand stitching the hem on the sample which I started last weekend and starting a folder of photos for inspiration. A good friend and collegue has been doing Venice Carnival for years. I find her costumes an amazing inpsiration for weaving. If you're ever in need of color inspiration her board is a great place to start! 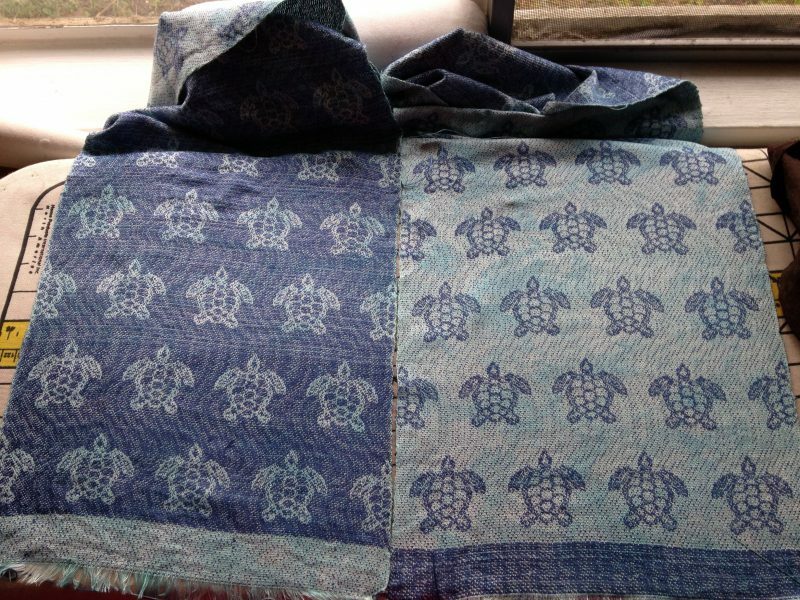 I needed to do some fiddling with the design - the turtles were too squat, so I lengthened them by about 20%, and I made the turtles reverse at the center of the scarf so they would appear to be swimming the same direction when the scarf is worn. I designed the scarf to be 72", 5040 picks - I think it will wind up being about 75" plus beaded fringe, which is perhaps a trifle long, but we'll see. I am now 1800 picks in, and hope to finish it before surgery. But I am not going to push myself on that; I'm doing my best to take it easy the next few days, so I'll be well-rested, well-prepared, and relaxed for surgery on Thursday. 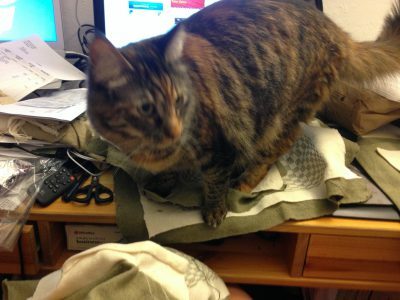 Admittedly, said "help" consisted mostly of batting at the thread while I was trying to sew, or sitting on the placemat I was trying to hem, but it's the thought that counts, right? After TAJ went to be, we put on Hercules and I finished sample #2 for this weekend! I am very proud of this, I gotin m7ch more than 10 mins. the past 2 days, which probably made up for the several days where I achieved 0 mins. of weaving. Good job, Erica; the block twill, esp the first photo, looks amazing. I'm falling down on my 10 minutes a day as I am in Florida (for work), returning Wednesday, and then off to DC for the better part of a week on Sunday. Tien, those slimmer turtles look great! Trying to plan my sateen samples when I have time. And finally - I love the thumbs up buttons, too! 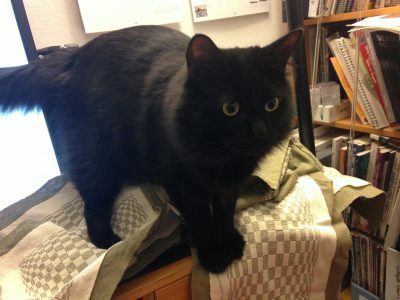 I feel so inspired by all these looms and busy weavers and inquisitive cats! 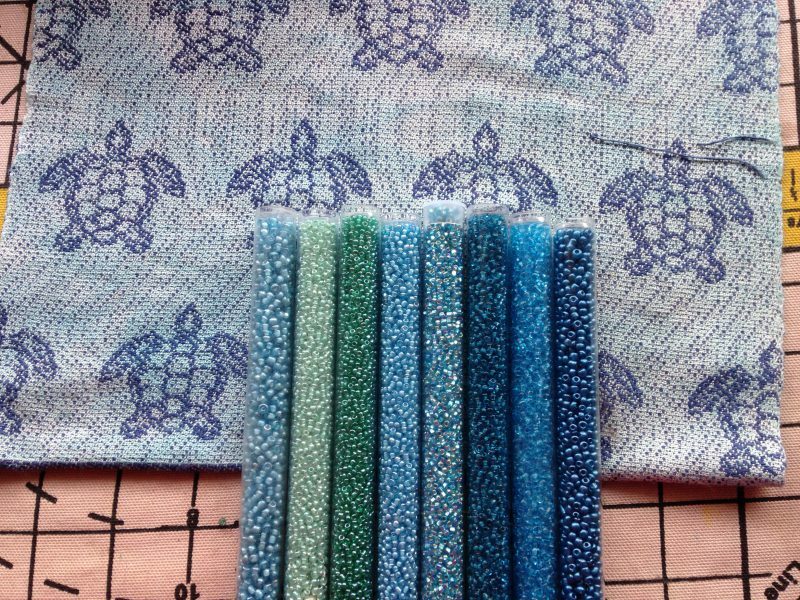 The turtles are just fab and I'm loving what is coming up in the Mastering Weave Structures Class ! ReedGuy every time I see your loom I'm in awe that you built it! It's a beautiful piece of equipment! I did something crazy again last week. With daunting deadlines for work and weaving looming, plus extensive shoveling from at least two snow storms, I decided impromptu to join a 2 day workshop about 7 p.m. Thursday eve. I started warping @ 9 p.m., (160 warp ends of 10/2, at 8" wide). I employed all my speedy warping techniques, including winding from 3 cones of similar value colors, and I finished in 3 hours, by midnight. Since I keep all my weaving tools in a tool tote, it was easy to throw everything in the car and GO early the next morning. The workshop was WONDERFUL. I had no idea how great it would be and I am so glad I decided to do it. The presenter was Susan Wilson on crackle. I thought I knew crackle, but this workshop was like signing up for Spanish, and learning German, French, Latin, and a smattering of exotic languages, too! There was a lot of time spent "old school" drafting (not on the computer, but in ways that you could carry in your head and translate to weaving on the loom). With this structure and the way she presented it, it is actually faster and made more sense to skip the computer drawdowns, because they can't exactly show you want is happening on the loom with the threads – somewhat like doubleweave. This was another one of those workshops that will alter the course of my weaving life-not necessarily because I want to weave a bunch of crackle, but rather my understanding of this structure and how it relates to other structures, variations in treadling, and how to really read some of the old drafts (it was like being provided with the secret code to decipher what the draft is really showing you, regardless of how it might be labeled.) It was a WOW! If this workshop opportunity comes up near you, take it! P.S. Reed Guy, I love that idea for a cloth protector! Going to start planning my placemats soon! In addition to the ones for my boyfriend's parents, I will make several sets in seasonal colors for our use. Planning on Sugar 'n Cream cotton yarn because it's easy to get, inexpensive, and washes well. Here's sending you healing thoughts Laura! and posted a project for today's weaverliness. Finally finished the color and weave towels - yippy! On to really good news - looking around outside, since it is finally sunny and sort of warm, I have daffodils peaking their little legs up out of the ground here in SE Wisconsin. Of course all the other ones are still under a foot of snow, but where there is bare ground, there are daffodils. Sally, your workshop sounds wonderful!! I will have to take the class if it's ever offered near me. Which ones to use will have to be figured out after surgery, which starts at 7:30 am today (in about three hours!). I have a really skilled (renowned) surgeon, but I'm still a bit nervous! Yes, your workshop DOES sound mind expanding, it's one of those eye opening wonderful moments! I have had a few teachers who have done that for me , and I have been eternally grateful. The right time, the right teacher, magic! Susan Wilson was here and everyone said she was fantastic, I was out of town, darn! I finished weaving the pillow cases, I hand washed, but put it in the washer for a rinse......then out it comes to dry. I am in AZ now, and last night I visited the Telarana Weavers Guild. A huge guild and they had a great mini-workshop program. (Also, great baked goods for snacks!) I guess I am going for a record of 4 guild meetings and one workshop in two states over a two week span! I had to download images this morning, my camera is getting full, and I pulled one up from the workshop. Believe it or not, that is the same purple warp across each row. It is the background tabby that shifts the color when weaving traditional crackle (which we learned about from Susan.) If you are a color-junkie, this might be the structure for you! (Note the weft colors off to the side). lol, love it Sally ! I am a color junkie and your weaving illustrating color being relative is great !